Price valid for travel up until 31 March 2019. Please chat with our team for pricing from 1 April 2019. 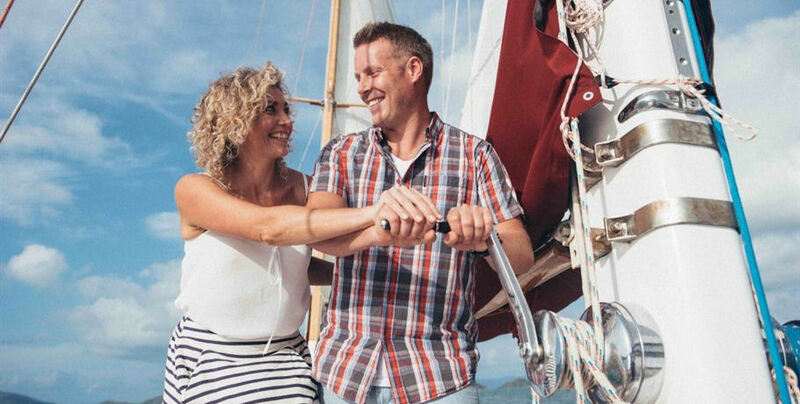 This is an adult (18+) only sailing experience. 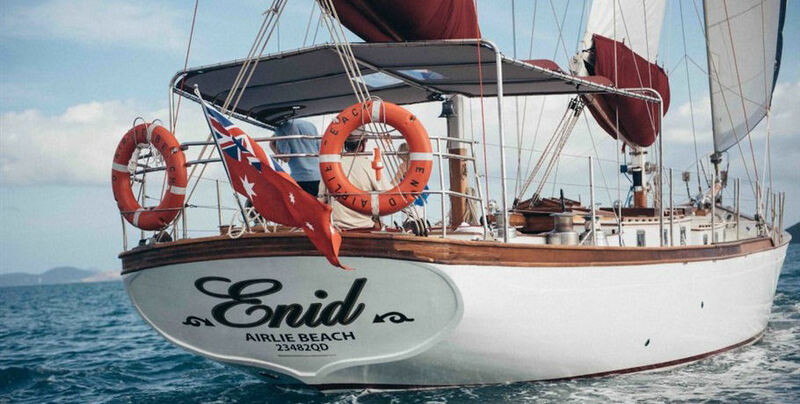 As elegant as her name, Lady Enid remembers the classic age of yachting perfected in the 1960s by the Australian greats. 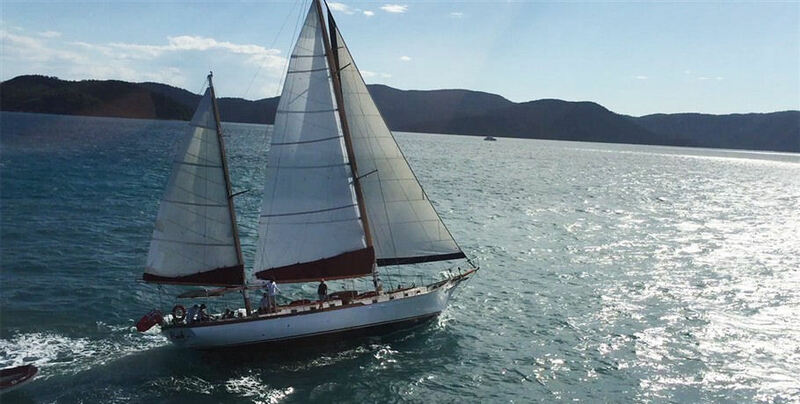 You will feel the luxury of an era less about corporate sponsorship and carbon fibre and more about the romance of sailing while aboard this rare heritage yacht in the stunning Whitsundays. 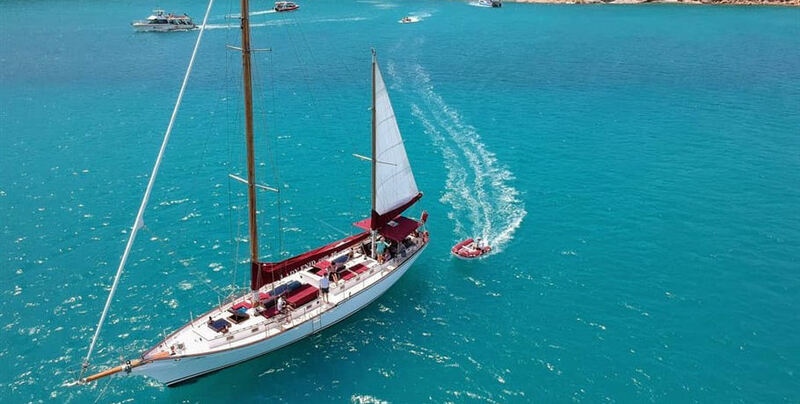 Your three attentive crew are there to make your day perfect, boasting immense local knowledge including the history of the Lady Enid and the surrounding islands. 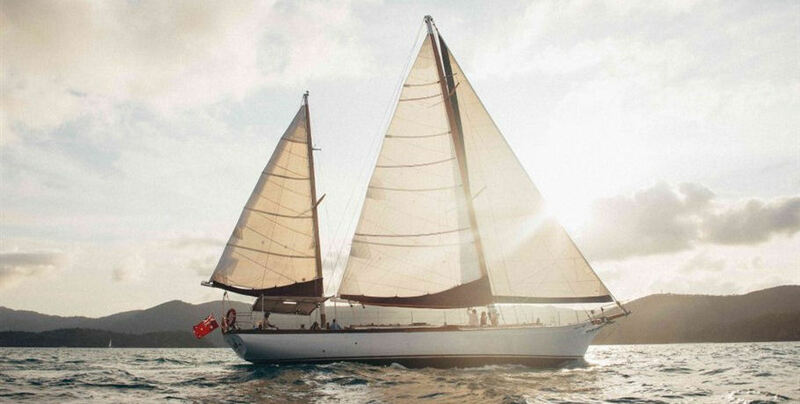 The small group of 24 guests is well below the capacity of the yacht allowing for a relaxed and boutique experience. The day will consist of gorgeous coral gardens, pristine white sand, and silky-smooth azure waters as you sail through the Whitsundays. 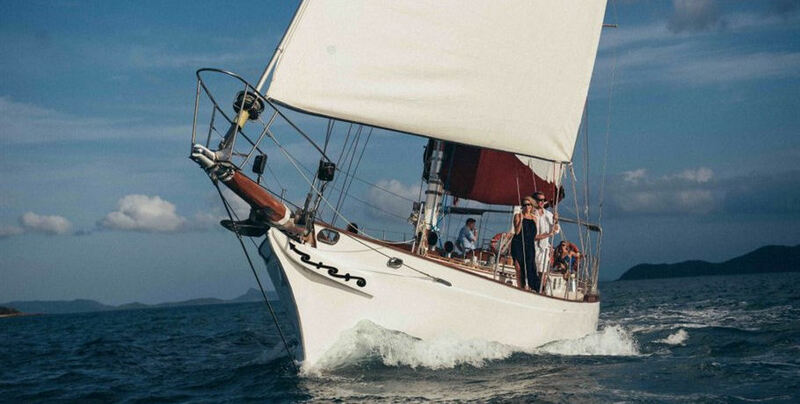 You will have a visit to the world-famous Whitehaven Beach as well as enjoy a sunset sail home after your day on the water. Several gourmet meals are included in your day really rounding out the daydream that is a Lady Enid experience. The courtesy bus will collect you from your Airlie Beach accommodation and take you to the Abell Point Marina for your 7:30am departure. Your friendly crew will be waiting to greet you on the deck of Lady Enid and will show you where to store your bags and shoes for the day’s sailing. 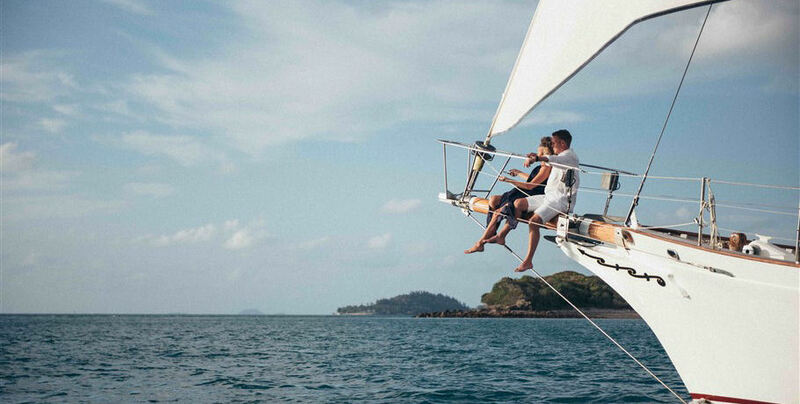 It is best to enjoy a day barefoot on the boat. Enjoy a brief tour of the yacht and a safety demonstration before being handed a courtesy bottle of spring water. You are welcome to request refills of this bottle throughout the day as required. Settle into the comfortable seating and order a hot drink form the crew including a variety of teas, coffee, or hot chocolate. Now the formalities are out of the way it’ s time to begin your luxurious day in the Whitsundays! 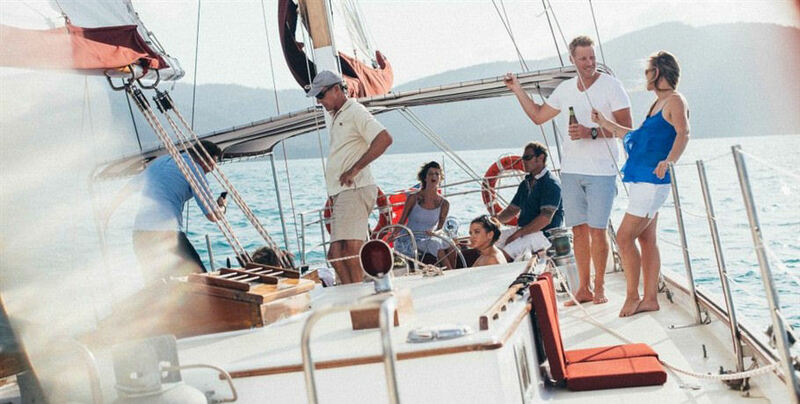 Once you have enjoyed your drinks, the crew will hoist the sails and begin your departure from the marina. 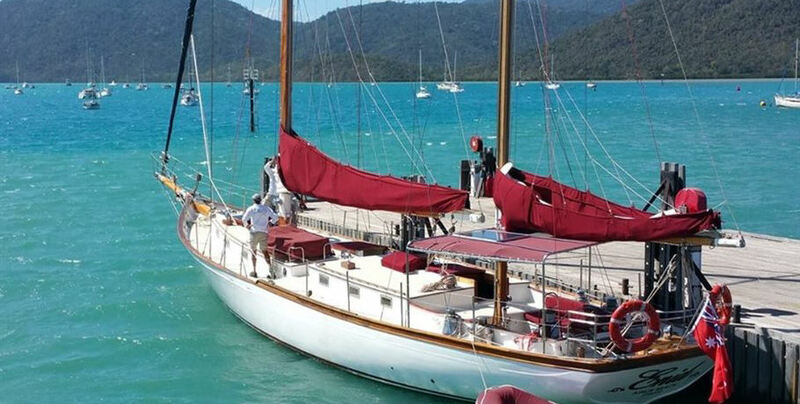 If your Whitsunday sailing dream consists of learning the ropes- now is your chance! The crew welcome a helping hand heaving the lines and the skipper will be happy to allow you to take a turn on the helm - it is of course the most important part of sailing. 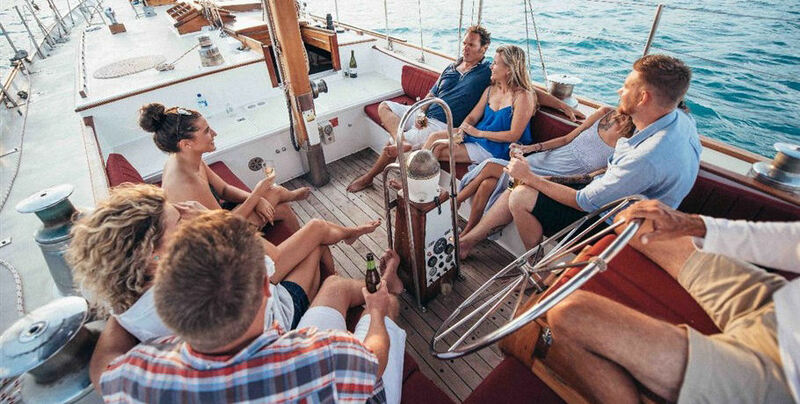 Throughout the sail across the Whitsunday passage you are free to move around the vessel and take advantage of the multiple seating options. The crew will point out various points of interest throughout the Islands and discuss the history of the area and the yacht herself. Morning tea will be served as Lady Enid reaches the smoother waters in the shelter of the Islands. Lady Enid’s first destination for the day is Tongue Bay, the perfect location to disembark the boat and enjoy an easy walk through beautiful rainforest to the Hill Inlet Lookout. This shows an incredible view over the shifting swirling sands of Whitehaven Beach and is the perfect location for those all-important photographs. The crew will then show you to the world-famous Whitehaven Beach, with 98% silica sand and turquoise waters it’ll be clear why this is regularly voted one of the top ten beaches in the world. After a morning of relaxation, it’s time to refuel back onboard the open deck of the Lady Enid. Lunch will be served at approximately 1pm and, once enjoyed, the crew will sail you to the island snorkelling destination. Snorkelling is always optional for guests and those not taking part may enjoy a cold beer or glass of wine on deck and just relax. Guests wishing to snorkel can enjoy the abundance of vibrant marine life, stunning corals, and cool waters with the provided snorkelling equipment. This anchorage point will be attended for approximately 40 minutes, giving plenty of opportunity to enjoy the water and deck if you choose. The snorkelling anchorage point is the final for the day however the adventure is not yet over. Enjoy a delicious high tea as you sail back across the Whitsunday Passage to the Port of Airlie Marina. You may also assist the crew on this journey or simply relax with the breeze in your hair and the sun on your face. Many guests enjoy a glass of champagne to finalise their day onboard. The courtesy bus will be waiting as Lady Enid returns to berth at approximately 5pm. If you prefer, we can drop you on the Airlie Beach main strip where many restaurants offer a delicious meal to complete your day. At all times Lady Enid crew will ensure we take the safest and most comfortable route to ensure the best experience possible, the timing of this experience is dependent on the weather. All tours are subject to minimum numbers and to weather conditions and so may cancelled at the discretion of the operator. We also reserve the right to alter the destination pending the weather for your safety and comfort. The company will offer alternative days or full refunds in the event of cancellations within 24 hours of cancellation. If you, our guests cancel within 24 hours or less notice, the cancellation fee is 100%. 24 to 48 hours notice 50% late fee.